You've tasted the delicious goodness of VITAGEN. Now, learn how it's made! The VITAGEN Tour brings you on a fun-filled learning experience about Malaysia's No. 1 Cultured Milk Drink, showing you how each delicious bottle packed with billions of live probiotic cultures makes its way from our factory to you. See for yourself how VITAGEN is manufactured using state-of-the-art technology and view our stringent quality control procedures which conform to the highest international standards. We're proud of what we do, and we'd love to share our passion and dedication for a healthier Malaysia with you – so register your interest today! 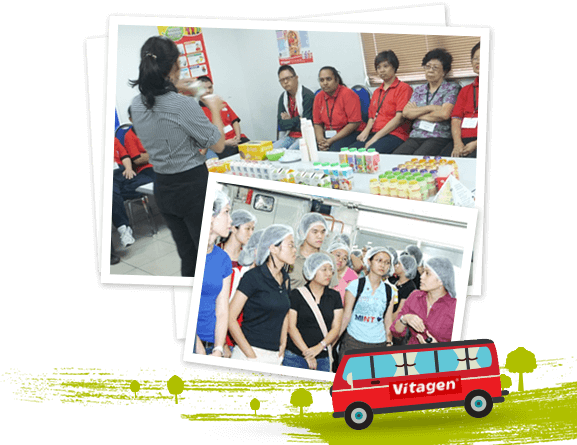 The VITAGEN Health Educational Tour is conducted on weekdays, with morning and afternoon sessions available. Admission is free.